Liberty of London made their reputation first by importing the finest Oriental fabrics, and later by producing fabrics of their own design. Arthur Lasenby Liberty was born in 1843 in Chesham, Buckinghamshire, England, the son of a draper. When Liberty was sixteen, he worked first for an uncle who owned a lace warehouse and then in 1859 he became an apprentice to a draper. He then found a position at Farmer & Rogers’ Great Shawl and Cloak Emporium, a position that was to set him on the course of his life’s work. After being the manager of the Oriental Warehouse for over ten years, Liberty decided to open his own business selling Oriental imports. This shop, called the East India House, was opened by Arthur Liberty in 1875. The original store was on Regent Street, and they sold mainly objects from the East – rugs, fabrics and decorative objects. Within a few years, Liberty’s Oriental fabrics were so popular that the store, now called Liberty, had a difficult time meeting the demand they had created. Liberty began to import undyed silk, cashmere and cotton fabrics, which were then handprinted in England, in the style of Oriental fabrics. In 1925, a new store was opened in Great Marlborough Street. This store was in the Tudor Revival style, and it still houses Liberty. 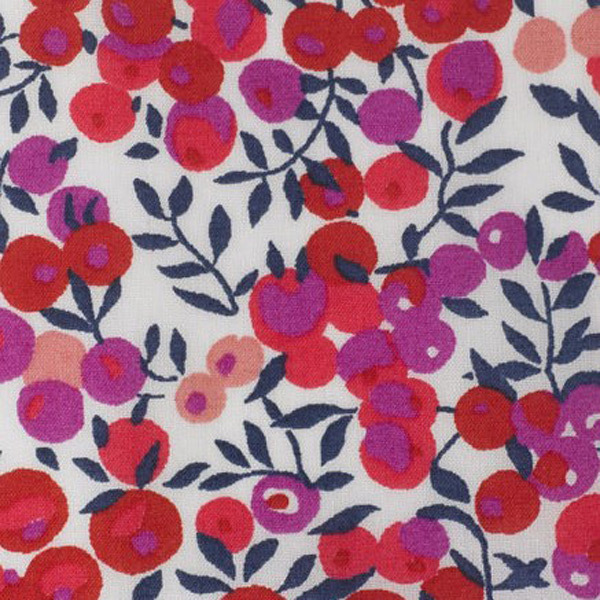 Also in the 1920s, Liberty began to produce small floral prints that became known as Liberty Prints. The best known of the fabrics of this time was the Tana Lawn, which is still a Liberty best-seller. Tana Lawn was so named because the cotton from which it was made originated in the area near Tana Lake in the Sudan. Lawn is a lightweight, semi-sheer, plain weave fabric, and Liberty’s version strikes a wonderful balance of drape and body that makes it versatile enough for a wide range of projects. Over the years, many of the world’s best designers have used Liberty fabrics. Jean Muir (who worked at Liberty for a time), Cacharel and Mary Quant are just a few. Many of these designs, especially those of the late 1960s and early 1970s reflected well on the Liberty legacy of romantic designs. Today Liberty is still known for the fabrics and scarves that made them famous. I love all things Liberty and use their beautiful fabrics for my headwear as the quality of the fabric, the colours used & the designs of the prints are hard to beat. For a full range of Liberty print easy tie headscarves please look at the Alice style and I also use Liberty jersey fabrics for my stretchy Olive, Rose, Lucy & Kitty styles.